Unfortunately there isn’t much colour selection, however if you really want to customize it, you can spray paint it, although it is not advised. If you want other colours, please check out our other electric scooter reviews. I personally find the black/grey one to be the best choice. If you happen to get it wet, dirty, etc, it’s not as noticeable. However, if you let it sit for a long time without riding, the dust is pretty visible and noticeable, but it’s not a big problem, just get a wet cloth and clean it. If you prefer having a bit of character to your electric scooter, then you could try the white one. Although it gets/looks more dirtier, some people do enjoy having it looking rugged. The white ones are out of stock most of the times and are more rarer to come across. There is a red LED backlight on the rear tire. It is small and it only flashes when you are using the breaks, so riding the scooter during the night on the road is dangerous if there’s isn’t much headlight. To check your battery level or perhaps put the Xiaomi on cruise control, there is actually an app specifically designed for the scooter. It connects via bluetooth and you can do some cool things with it. Yes you can attach a seat to it. Though I prefer just riding it without the seat because maintaining balance is harder, and it just feels awkward when everyone is starting at you. However, you can get one of these saddles seats and attach it to the scooter if you prefer. Depending on where you buy it and if you are willing to go through the hassle of paying shipping taxes, paperwork, etc, it can be cheaper. However, it is best to just buy it off Amazon if you don’t have as much time to spare researching how to import it and preparing the paperwork. Usually the price is $400-$500 depending on the condition, battery-life, extra attachments, etc. It’s a bit cheaper, $300-$400 dollar if you ship it from overseas. If you don’t include the seat, then it is around 25lbs or 12kgs. Carrying it here and there won’t be much of a problem, but holding it for longer periods of time can give you sore forearms, shoulders, and traps. Comparitively it is a bit heavier than other electronic scooters out there. Compared with a smaller non electric scooters and skateboards, it is not as portable, but it is more portable than bicycles. You can fold it along the neck and carry it with you into the office, shopping malls, etc; you will get curious stares though as it’s not that inconspicuous. Going up the stairs is possible, just be careful of accidentally hitting someone with it. The only problem I have with portability is the steering handle. They don’t fold and stick out to the sides, though it’s just a minor thing. Depending on how heavy you are, it can reach top speeds of 25-30km/hour (15-19 mph). If there is a bike path alongside the road, you should be able to commute 7-8km (5 miles) in about 15 minutes. If you have to weave through people and stop at red lights etc, it will take you about 25 minutes. In certain instances you can arrive at your destination faster than you would in a car. There is economy mode and normal mode, so assuming you go with the economy mode, you can almost go 30km ( ~18 miles). The economy mode allows you to save battery by reducing the accelaration speed and top speed for optimal performance. However, if you just go with the normal mode, on average you can go about 24km (15 miles). Be mindful of the battery life-span though; the more recklessly you ride and charge it, the shorter the distance. Maintenance does not take much time, it only takes a few minutes every other week to make sure it’s safe to ride. The scooter can take quite a bit of punishment, is quite sturdy, and even rust resistant, however, if you want to make your Xiaomi electric scooter to last longer, follow these rules. Since the electric moter is inside the front wheel, using a water hose is not recommended, instead use a damp wash cloth to clean any dirt and dust. The standing board is where it gets the dirtiest and since the surface is made of rubber for better grip, you need to soak it with wash cloth and work your way. Do try to keep it away from dirt and mud as much as possible since it was not necessarily designed to go over those kinds of surfaces. The neck noose can get a bit loose especially if you ride it over rough or shaky terrain. You will have to tighten the bolts and check on any other loose screws along the steering wheel and the tires. If you have the equipment, it shouldn’t take more than a few minutes. The standard battery pack that comes with it is Lithium ion 7800 mAH battery.Usually the battery takes about 4 hours for a full charge, and it is recommended to charge it when battery is half empty, and unplugging the charger when you are 90% there for a full battery lifespan. The battery pack is stored under the stand board, and its composition is very interesting. It’s not a big battery block, but rather small batteries connected together, so if you ever want to upgrade the battery pack or need to change it, it will take a bit more time. If you happen to be travelling through China, you could grab one at an electronics store or order it through local delivery. However, order it a few days before you are about to leave. You won’t be allowed to take it as carry on, so you will pay extra luggage costs. Or perhaps you can order through Alibaba.com, but it will take some time to ship and you will have to deal with customs. If you access to Amazon, I would just recommend ordering one through Amazon, since it’s less of a hassle, customs won’t get involved, and less likely to get delayed en route. The neck noose can get loose from time to time and it doesn’t feel as rigid; there’s just the irking feeling of slight looseness when riding it if you don’t tighten it enough. The rubber handles aren’t that comfortable and can get quite sticky, so it’s best to replace them with something more comfortable, and the breaks have to be tightened from time to time. You can decide for yourself after watching this short and accurate video review of the product. 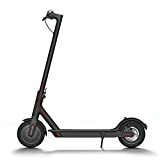 If you’re looking for a semi-portable scooter that’s great for commuting around metropolitan cities then this is perfect. If there’s a clear bike path and free room to ride the Xiaomi, it feels amazing cruising at 30 kph with the wind in your hair. Riding in congested areas is just too much of a hassle and not as pleasant, but in open spaces this really is a joy to ride.